The main stand at Wheldon Road, home of first:utility Super League Castleford Tigers RLFC. The 50-yard structure dates from 1935. It replaced a stand destroyed by a fire blamed on an unattended coke stove in a hut that served as a dressing room. Thanks to the effects of the draconian Taylor Report, this is now one of the few remaining traditional rugby league venues. The club hopes to relocate to a new stadium in the Whitwood district of the town. Castleford played their first senior game, a 3-0 defeat by Huddersfield, at Wheldon Road in 1927. It was the former home of Castleford Town, an ailing and now defunct football club. The record attendance here is 25,449, set in 1935 for a Challenge Cup third round tie with Hunslet. Present average crowd is about 8,000. 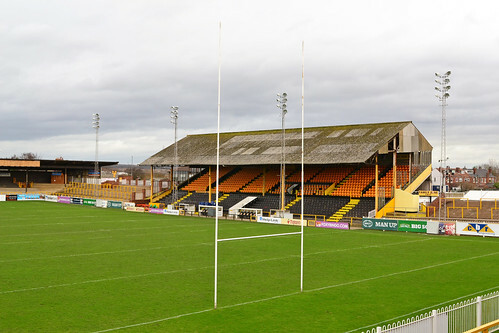 Under a naming rights deal, Wheldon Road is known as the Mend-a-Hose Jungle. Comment superfluous!